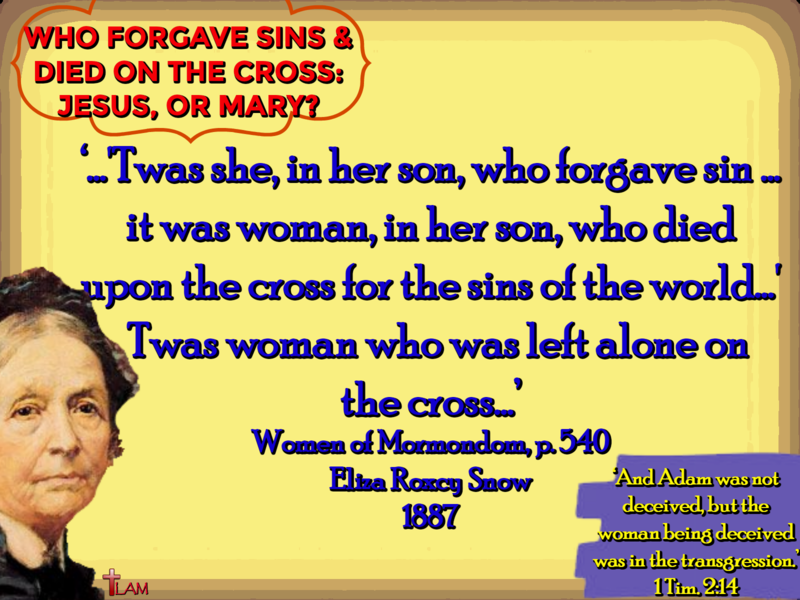 Who Forgave Sins and Died on the Cross: Jesus, or Mary? The following is an excerpt from Women of Mormondom, written by Relief Society President, Eliza Roxcy Snow in 1887. Women of Mormondom, p.540 “The mother of Jesus a virgin of the house of David, and not a flaming goddess from the skies. From woman, the love of Jesus for humanity. From her his sympathies for the race. ‘Twas she, in her son, who forgave sin; she who bade the sinner go and sin no more; she who wept over Jerusalem as a mother weepeth over her young And it was woman, in her son, who died upon the cross for the sins of the world! Hebrews 1:3 “Who being the brightness of his glory, and the express image of his person, and upholding all things by the word of his power, when he had by himself purged our sins, sat down on the right hand of the Majesty on high”. There have been few, if any, writings more blasphemous than Ms. Snow’s. With the stroke of a pen she denounced Jesus, and filled the shoes of a false prophet. Being in the position of the Relief Society President holds a lot of responsibility, and for some reason the Church continues to condone this behavior by not denouncing her theories. Let us be diligent in praying that Mormons will see Ms. Snow’s beliefs, and turn to the Lord!